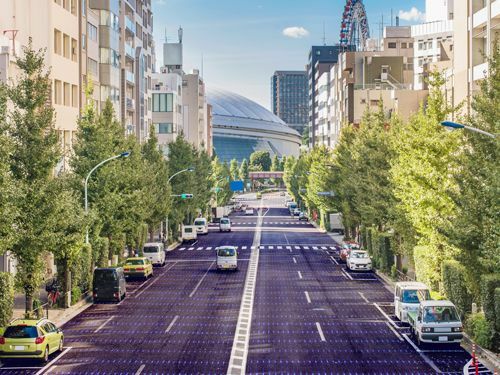 These cutting-edge roads are made of load bearing solar panels are cover in a special resin. As locals traffic goes about their daily business the road below. Parts have been construed and tested can generate up to 16.145 kilowatts per hour estimated. powering a local Seven-Eleven store covering about 9% of there entire years consumption. Last year solar road technology was tested along the famous route 66. This entry was posted in Uncategorised on 25th June 2018 by Damian Toner. OLED TV what's the big deal? That allows each individual pixel to independent of each other. Each pixel is made of organic cells behind the screen, which produce their own light source sounds very like the old plasma technology and yes you are right same premise small cells just a lot more of them. Smooth motion: Motion looks good on OLED TVs, with far less blurring, even on fast-moving action. This entry was posted in Uncategorised on 5th June 2018 by Damian Toner. regularly in order to maintain a top-class performance. Cleaning your washing machine will ensure that you dispose of any detergent residue as well as any other unwanted bits and pieces that may have come off your clothes. ensuring cleaner hoses and a maximum performance. White vinegar isn’t only good for cleanliness, it also improves the machines performance and life expectancy. Get sponge some water and dish soap and use a bit of elbow grease. Mould and mildew will appear over time. This entry was posted in Uncategorised on 28th April 2018 by Damian Toner. Leaving your TV on for extended and unnecessary periods of time can eventually wear down its technical abilities and run up those energy bills Make sure to turn your TV off when you aren’t viewing it. Not only will this prolong the life of your new LED TV, it will minimise the chances of that surprise when you open that dreaded electricity bill. Adjusting the contrast can significantly increase the lifespan of your LED TV. Contrast basically refers to the difference to the maximum and minimum pixel intensity in an image. By adjusting the contrast to the recommended settings can significantly add to the life of your TV. Having the brightness levels set at a high level isn’t a good idea. Home viewing should be at a comfortable level of brightness to suit your household needs on a daily basis. Having a high level of brightness makes the TV over-perform, straining the internal components decreasing the over-all life span significantly. Ensuring your TV is kept in a cool, well ventilated area will reduce the damage to the internal components caused by over-heating. Keeping you cool and calm with problem free viewing. We take our electricity power supply for granted, until there is a power cut which plunges us into the dark ages… literally. Not many of us will know, that there is little power surges as well as decreases in supply on a daily basis which can spell disaster for your LED TV. By purchasing a Surge Protector you will provide regulation to the power supply flowing to your TV, protecting it from the impact of outside forces. Thinking of updating your TV to a LED TV? Visit us today in store or click the link below! This entry was posted in Uncategorised on 30th June 2017 by Damian Toner. Cool down in summer and warm up in winter with our Nutri-Bullet RX. We are currently stocking the new Nutri Bullet RX in store, just in time for summer! This super smart appliance pre-programmed to ensure you are receiving the optimal nutritional benefits of your fruit and veg so no need to worry about changing settings each time you use it. Make sure the kids are healthy this summer with the Nutri-Bullet RX. Creating fun and colourful smoothies has never been easier with the sleek, easy clean design. An easy way to include a portion of fuit or two of their choice. Perfect for even the fussiest little appetites. If you like Pina Colada’s, and dancing in the rain (let’s face it, Nothern Ireland weather is a little unpredictable) then the Nutri-Bullet RX is the perfect for your Friday night get-together with friends. Making cocktails couldn’t be easier as this appliance has measurement markings on the jug to ensure the perfect mix. Feeling a little chilly? Warm up by creating a savoury soup within minutes using the Souper Blast mode. The Nutri-Bullet RX has a 7 Minute heating cycle that turns vegetables into soup with the press of a button. Perfect for those cold winter evenings. Not only does this appliance look good and easy to use, the benefits which it yields are incredible. The Nutri-Bullet RX can cater to specific needs such as detoxing, soothing inflammation and immune boosting. It can even help against anti ageing and empower brains of all ages! Pop in store today to pick yours up today for only £179 or click the link below! This entry was posted in Uncategorised on 29th June 2017 by Damian Toner. The saying ‘you never miss it until its broken’ is more than relevant to your kitchen appliances, especially your washing machine. Here a few simple tips to keep your washing machine in tip-top shape. Taking a few seconds to check your pockets before placing them in the washing machine can add years to the lifespan of your washing machine. Items such as coins, screws and pens can damage the drum and even destroy it completely. Items such as these can also get stuck in the drain line which prevents the water from draining from the machine properly which can result in more trouble for your machine. No matter what the reason, we are all guilty of over loading our washing machines. If its after a long week at work, your son or daughter have returned home from university for the weekend with a stack of endless laundry or ‘the chair’ cant hold any more laundry. We tend to overload our machines on a somewhat regular basis. Overloading the machine can contribute greatly to the wearing of the mechanical components. Check the manufacturers recommended load size and ensure there is enough space in the drum to let the clothes move freely throughout the wash. Although overloading can have damaging effects, the same can be said for under loading the machine. Washing a small handful of garments can have just as much damaging effects on the machine as over loading. Hearing the loud rumble and vibration of the washing machine on a Saturday morning may not be appreciated by those who enjoying a late morning snooze. This problem can be easily solved by adjusting the feet located on the bottom of the machine to be correctly aligned with the floor. With an array of perfumed products to suit even the most fussy, it is easy to use excessive amounts of detergent on a load. Unfortunately this makes no difference to the cleanliness of the laundry and is harmful to the machine. Over use of a detergent promotes the growth of mildew and mould which can have the opposite desired effect on the laundry! This mildew and mould can settle in crevices and cracks and create a build up, reducing the life span of the machine. By using detergent wisely, not only will you notice the positive effect on the washing machine but you will also notice a little savings on your shopping bill! 4K TV has finally arrived and it's as good as we thought! Just as the world had got used to seeing the world in Full HD detail, 4K TV arrives to bring even more clarity to our viewing experiences. For those not yet in the know, let conway.tv, experts in 4K, explain. Also known as Ultra High Definition, Ultra HD, UHD and even SUHD, 4K has quadruple the number of pixels than regular Full HD, usually arranged as 3,840 x 2,160 for a 16:9 panel. Plus, since the arrival of HDMI 2.0 in 2013, 4K resolution can now be displayed at higher frame rates of 50 frames-per-second (fps) and 60fps, perfect for watching fast-paced, real-time programmes such as live sports. The higher pixel density and resolution has obviously increased file sizes, making them harder to share, which is an obstacle for any new technology looking to break into the mainstream. Thankfully, with the development of High Efficiency Video Codec (HEVC), the files can be efficiently compressed to make them smaller and much more manageable. For this reason, shoppers should look for a 4K TV capable of decoding HEVC. This entry was posted in Uncategorised on 14th September 2015 by Damian Toner. Conway TV have launched their new E-commerce website. Please feel free to browse our products from the menu above and buy online! This entry was posted in Uncategorised on 5th August 2015 by conwaytv-wp-admin.